Dr. Energy Saver installs radiant barrier installation in attics. We are experts on methods for increasing energy efficiency in your attic and throughout your entire home. If you've ever gotten into your car after it's been sitting in the summer sun for an hour or so, you know firsthand just how hot the car can get. Leather seats can literally make you jump, and it can take your car's air conditioning quite a while to make the space comfortable again. Why would a car's interior get so much hotter than the air outside? Because of radiant energy from the sun -- solar heat that keeps building up inside of your car. For your Free Radiant Barrier Estimate in Ohio, call or e-mail us today! 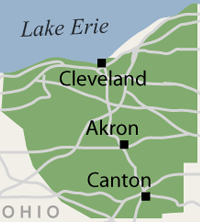 We serve Akron, Cleveland, Canton and surrounding Ohio areas near Elyria, Lorain, Medina, Massillon, Lakewood, Chagrin Falls, Strongsville, Hudson, Cuyahoga Falls, Ravenna, Bedford, North Royalton, Westlake, North Olmsted, Wooster, Painesville, Alliance, Kent, North Canton, Beachwood, Barberton, Willoughby, Gates Mills, Stow, Brunswick. Radiant Heat Barrier / Reflective Insulation - How Does it Work? Radiant barriers are sometimes referred to as "reflective insulation" and "radiant barrier insulation" because, like insulation, they can effectively slow the transfer of heat. The degree of insulation usually depicts the rate at which heat moves, for example, foam and cellulose are great insulators and force heat to move slowly. A radiant barrier, however, works differently. It actually reflects the heat energy back toward it source. For the best of both worlds, some types of rigid foam insulation are manufactured with a shiny foil facing that can function as a radiant barrier, combining the benefits of insulation and a radiant barrier. Dr. Energy Saver in Ohio can install a radiant barrier against the bottom edges of your rafters to help improve cooling efficiency in the summer and heating efficiency in the winter. Dr. Energy Saver provides professional radiant barrier insulation to attics. Our expert contractors are licensed to install radiant barrier insulation in Greater Cleveland, including many cities such as Cleveland, Akron, Canton, Medina, Massillon, Lorain, Elyria, Strongsville, Chagrin Falls, Lakewood, Hudson, Cuyahoga Falls, Ravenna, Bedford, North Royalton, Westlake, North Olmsted, Wooster, Painesville, Alliance, Kent, North Canton, Beachwood, Barberton, Willoughby, Gates Mills, Stow, Brunswick as well as many surrounding Ohio areas. Call 1-888-370-6924 or contact us online to schedule a free home inspection and radiant barrier estimate.